Earlier in the week, I had been rummaging around my bead drawers to see what had become lost/buried/forgotten and I found a little treasure amongst the tangle of strands which I haven't yet found homes for: a string of darling chicken/rooster beads. I couldn't resist them. They were bright and colourful and just so darn cheery! I knew right away they would become barnyard inspired earrings. But I still can't decide if they are hens or roosters! Aren't they fun? Their cute little wire feet add just a touch of whimsy. 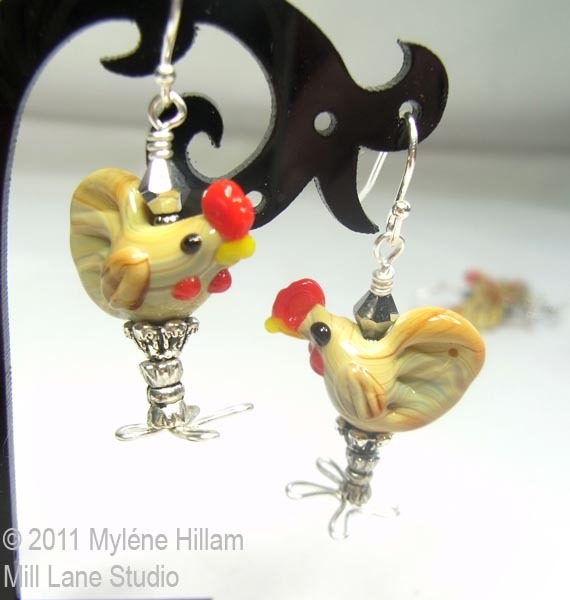 The Golden Cockerel earrings are available for purchase in my etsy shop, MillLaneStudio. Yes, my Etsy shop has undergone a name change. You can still find my listings under MHdesign but to keep everything uniform, you can now also find me listed under MillLaneStudio. These are so cute! I love the wire feet. I have some Rooster beads, but no feet. Thanks Lisa. The wire feet gives new meaning to the term "chicken wire"!